The original soft printmaking material. Easy to carve thickness (3/8"). Both sides can be carved. 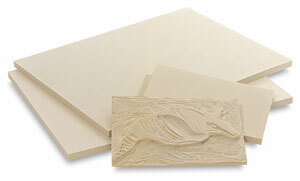 The 4" × 5-5/8" size is used for greeting cards and note cards. Cut smaller squares for rubber stamping (water-based inks).